Could Facebook Live For Groups Keep Your Group Alive? 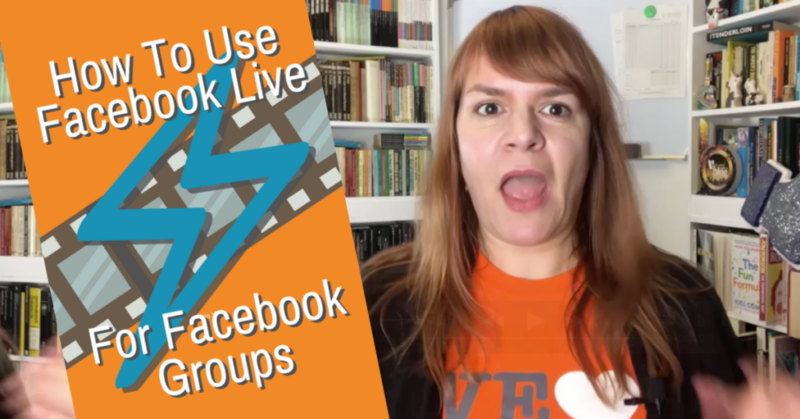 You are here: Home / Facebook / Could Facebook Live For Groups Keep Your Group Alive? I noticed something the other day. Perhaps you’ve done this too. I was scrolling through Facebook, I saw a post from a group I wanted to comment on, I commented and moved on. Then I realised I had no clue which group that post was from. 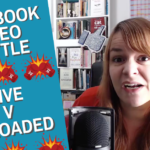 Facebook Live v Uploaded Video – Is The Honeymoon Over for Facebook Live? It’s easily done. On a personal or business page post you see the picture of the person or the page logo right next to it. With groups it’s different. Facebook prioritises the name and the profile picture of the group member, not the group. As our feed fills with group content we react and comment without taking a glance at the group name. As a group owner this makes me want to scream. All that time I’ve put into building an engaged community and what happens? People don’t even know it’s my group. Grrrrr. There are a lot of groups on Facebook. And when I say a lot, a lot. Back in 2010 AdWeek reported that there were 620 Million groups, and that was way before they were cool. Maintaining an active group with all that competition is becoming a challenge. It’s easier for members to make the connection between a face on a video and your group. 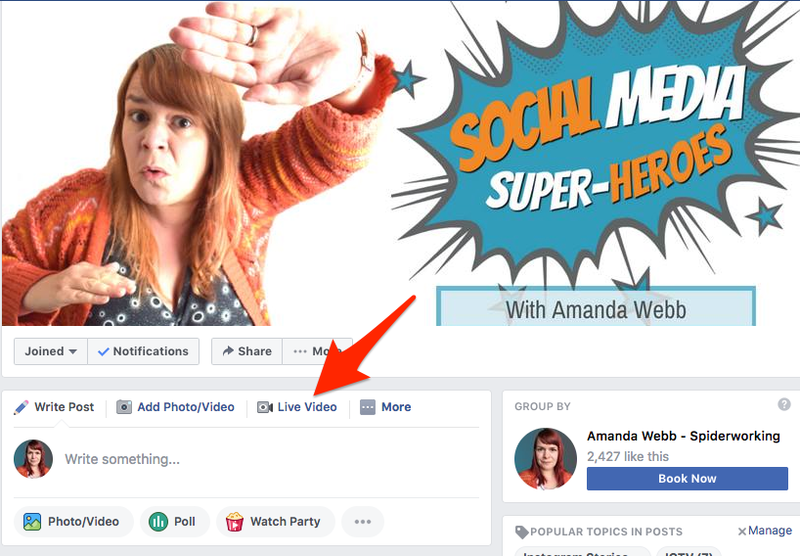 If you use Facebook live for groups, your members won’t just recognise you, they’ll feel like they know you. When they know you, they’re easier to convert into customers. 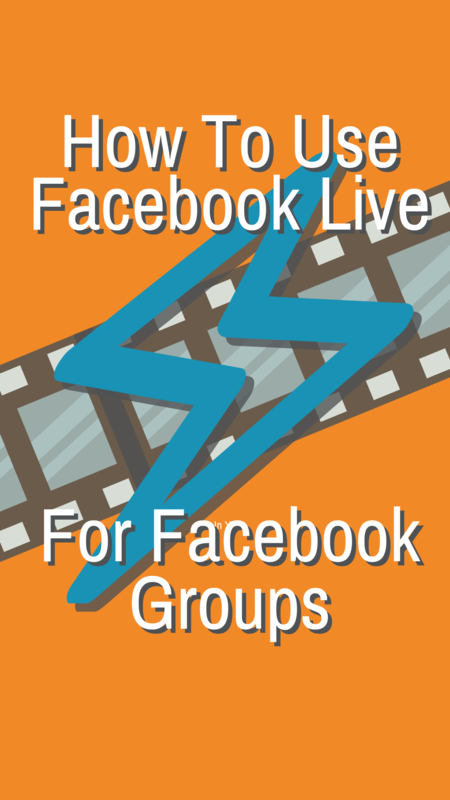 What live broadcasts should you create for your Facebook groups? You’ve set up a group, you are an authority on something even if it is just yourself. Give your audience a chance to pump your for that knowledge. Ahead of your broadcast ask for questions in the group. You can either tackle one big question each week or answer everything at once. I’ve been experimenting with this in my Social Media Superhero group. We focus on one topic every fortnight and I host a weekly live show answering questions related to that (or general questions if we don’t have enough). This gives me inspiration for blog topics too and if I don’t know he answers, I research or ask an expert for input. So far it’s been popular, but not as popular as my off-the-cuff broadcasts. Live broadcasts are better when planned. But there are exceptions. If you have a sudden burst of inspiration you are dying to share, go live. Share it with your community. Samantha Kelly does this in her Women Inspire Network group. Or, if you are out and about and you see something you know your group members will love, switch on your camera. Go live and share it with your audience. I go live almost every Monday in my group just to say hi. Annoyingly more people watch these random ramblings than my planned broadcasts. If you use a third-party tool for going live, you can run online training sessions. 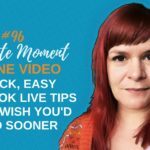 I now use Facebook Live to run all my online trainings. I have a special closed training group where I run the sessions. It’s handy as people can log straight into Facebook to take part. 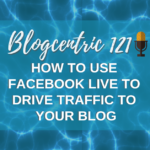 You can use it for paid trainings like this or use it to run free webinars to grow your group. It doesn’t always have to be you alone in a Live broadcast. You can take the pressure off yourself by inviting guests. You could interview public figures or feature a member. If you schedule these regularly, you’ll attract new members to the group. The easiest way to go live in a group is from your phone or your computer. If you want to level up your live broadcasts and add extra features, consider investing in third party software. It’s not as expensive as you may think and it will add a shine to your broadcasts. I use Ecamm Live from my Mac but Belive.tv is a popular choice for both Mac and Windows. 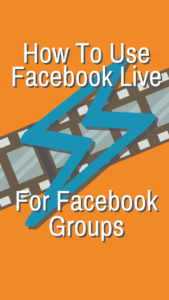 Schedule live broadcasts to your Facebook group in advance. Best of all, add your own branding or logo to your broadcasts. This will give scrollers an even stronger signal that the post is from your group. 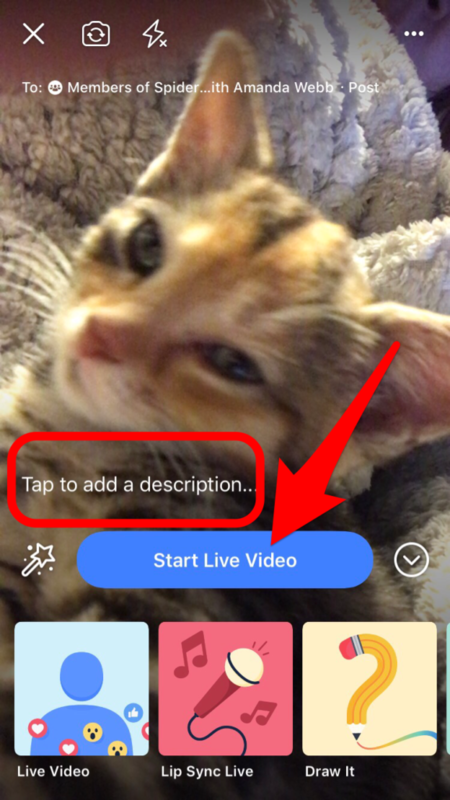 Although you can’t trim your live video, you can add thumbnails, captions and additional information. 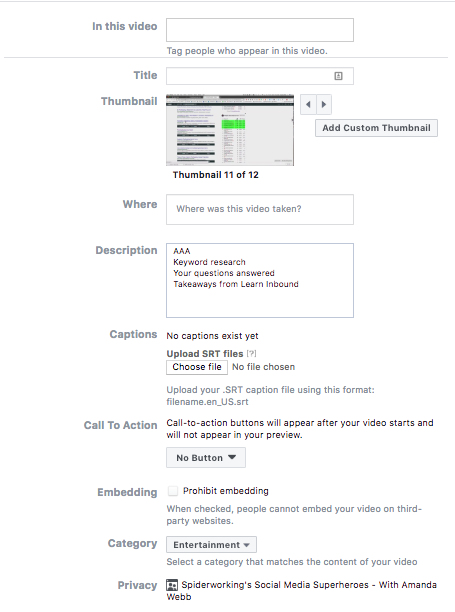 A thumbnail will make people more likely to click and watch. Subtitles mean that people can watch wherever they are even if they can’t switch the sound on. If you created a live broadcast packed with value, share it beyond your group to a wider audience. Sadly you can’t do this from Facebook itself. What you can do is download your broadcast, edit it and chop it into value blasts (small sections that showcase your wisdom). Or edit out the live elements and upload it to other places on Facebook, YouTube and anywhere that allows native video. 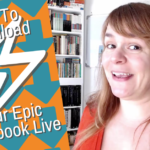 Should you go live as a page or person? 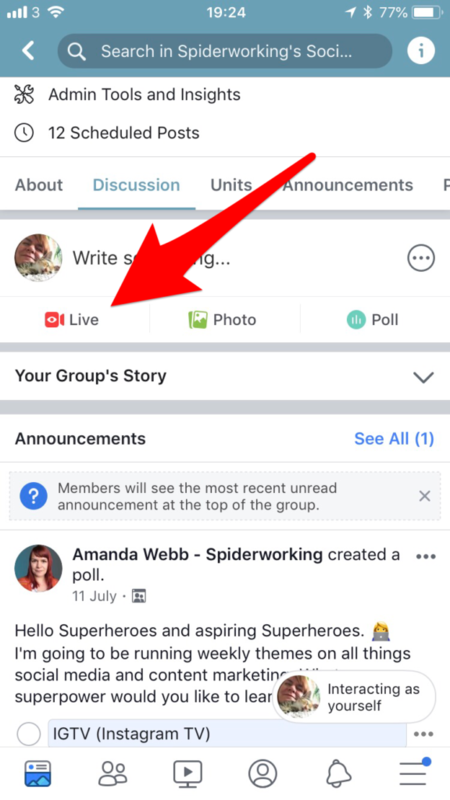 If you link your group to your Facebook page, you can choose if you want to go live as your page or as yourself. You can build a Facebook ad audience from the people who view your video. Don’t get too excited though, unless you have a massive viewer count this won’t be valuable. Your video post will appear next to your page name, it’s good branding and it will help people understand that the video is coming from your group. You’ll get more reach. Friends are notified and I have a hunch that Facebook pushes personal posts into more news-feeds. 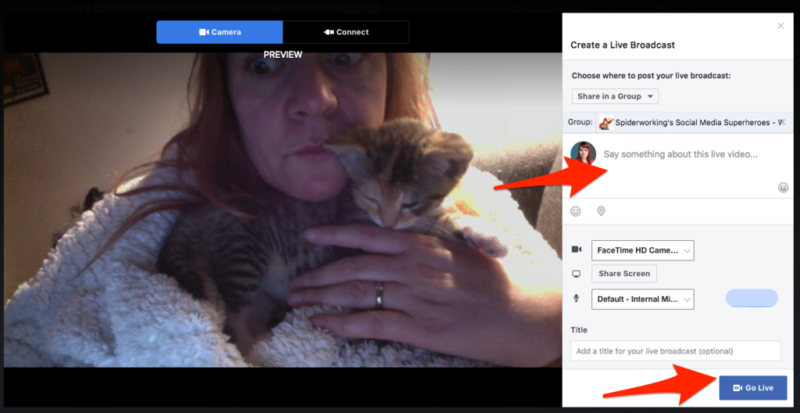 Whichever option you choose, using Facebook live for groups will help your brand shine through in the feed. Your audience won’t miss that this is a post from your group.